Antankaria signoreti (Metcalf, 1955) is found in Madagascar. It was formerly known as Antankaria madagascariensis. Yes, its species name has changed since 1913. 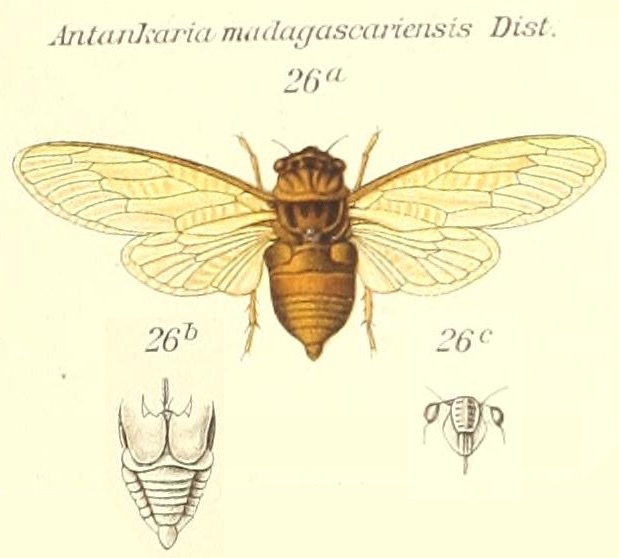 The image says Antankaria madagascariensis, but its newest name is Antankaria signoreti. Characters, — Length of head about half the breadth between eyes and (including eyes) as wide as base of mesonotum; eyes circular, globular, moderately directed upward; pronotum a little narrowed behind eyes, about as long as mesonotum in front of the cruciform elevation; abdomen longer than space between apex of face and base of cruciform elevation; rostrum reaching posterior coxae ; anterior femora strongly toothed beneath; opercula in type not passing the base of metasternum; tegmina and wings talc-like.